It's time for the Saint Remy Casserole Crusade! Last time I made two casseroles; today I decided to make five -- four for the soup kitchens, and one to keep in my freezer. Bring two quarts cups of chicken broth to a boil, then add a one pound bag of egg noodles. Bring back to a boil, then turn off for 20 minutes. Then strain out the noodles, mix with one can of cream of mushroom soup, one can of cream of chicken soup, and two cups of chicken meat. All that goes in a foil pan that they passed out in the back of church. While the noodles were cooking, I chopped up some onions and some celery. I cooked these nicely in some melted butter, adding a bit of garlic powder. And in place of chicken broth, I used chicken stock, for added flavor. And since I didn't have any cooking oil spray for the foil pans, I used butter. Only the best! Well, with enough fixings for five casseroles, I had some major quantities of food going on here; plus a lot of cans to open up while the noodles were cooking. That meant getting out every big pan I have, plus several smaller ones. This also meant mixing everything in two large pots, and doing some switching back and forth so that the proportions were even in both pots. It worked pretty well. One "oops" -- I was tasting it as I went along, only to remember: it's Friday! Sorry, Lord! When I got to the third one, I'm thinking, there's not enough for five casseroles! Sure enough, I had just enough to fill the four. (I guess I overfilled them.) I did get a couple of spoonfuls, just to see how it tasted. Verdict? Good, but too bland for my taste. I'd have added more salt, more black pepper (I'd thrown in a bit), and some red pepper. But from my experience, it's not a good idea to make food for large groups overly seasoned; some people just don't care for it. Now that I've got it all sealed up and in the freezer, I think some grated parmesan cheese would have been good over the top of it. In telling this story, I don't mean to brag. This wasn't a big deal -- it took about 90 minutes. I'm letting you know that if I can do this, so can you! Working on those casseroles has got me on a cooking jag this weekend. 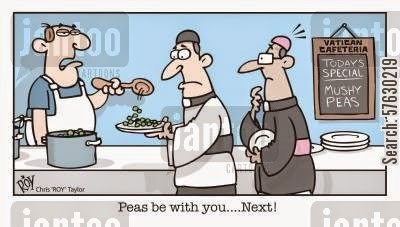 That's what happens, I guess, when I get my homily finished on Friday, and I haven't any appointments for today. 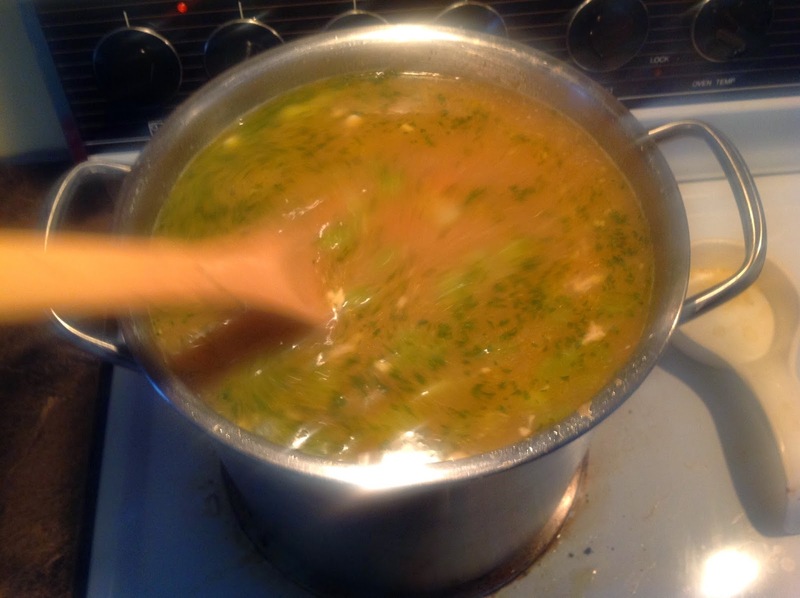 After finishing the noodle casseroles yesterday, I had a lot of leftover chicken stock; plus I had some chicken meat I hadn't used in the casseroles. So that means soup! I always keep a bag full of "soup junk" in the freezer: sorry looking onions, carrots and celery, onion skins, and any bones I might have, all of which are good for adding flavor to soup stock. So I got that out and dumped it into the leftover stock, and cooked that several hours yesterday. Last night I strained it, and put the pot into the fridge. It was a lot of stock. So this morning, before getting my breakfast, I put it back on the stove. 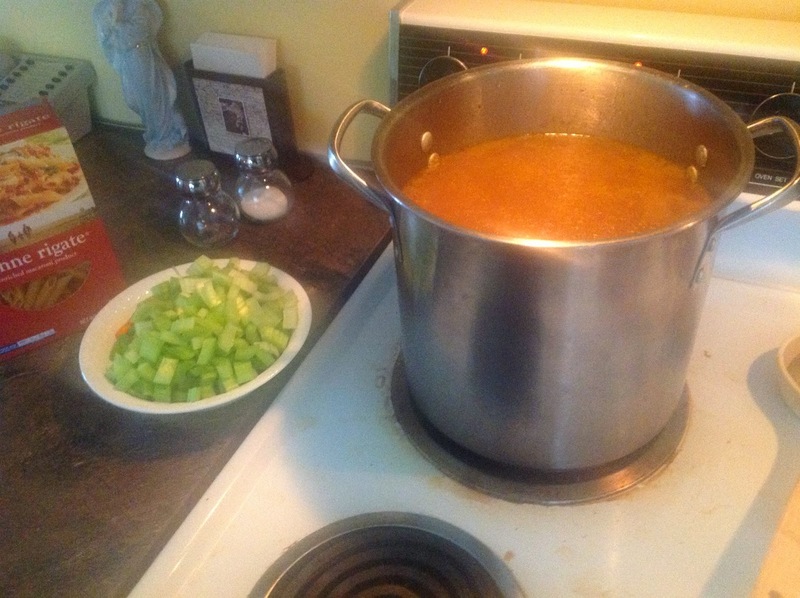 It's still there, simmering; I'm trying to cook down the liquid before adding some cut up carrots and celery (I'm all out of onions), some pasta, and later, the rest of the chicken. I may add a bit of parsley. I'm tempted to try tarragon, but I think that's better in chicken salad. What do you think? I'm not watching it at the moment, yet it still won't boil. 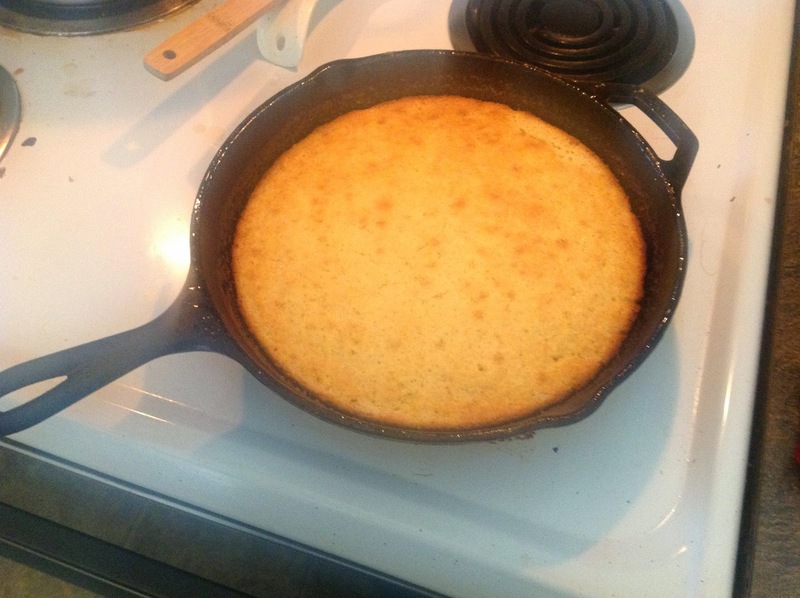 Oh, and inspired by a comment in one of my other cooking entries, I decided to make up some cornpone. I did it the super-easy way: using a Jiffy mix. Is that bad? Right after that, I cut me a slice -- ow, hot! -- and cut off a blob of butter. Yes, it really was as it good it as you think it was! There's nothing like the crust you get with cornbread when you cook it in an iron skillet (after melting a generous amount of butter first). The soup is "finished" -- at least, enough to try. It will certainly be better after it sits overnight, but as you can see, the pot is so full, I dasn't try to put it away like this. So I'll have a bowl, and I'm keeping it on the burner to simmer some more. Then I'll put it away to feed the staff on Tuesday. If there's enough left. Here I am, stirring it up a bit so you can see something more than parsley floating on top. And, yes, it is rather good! It would have been nice to have chopped onions, there's plenty of onion flavor in the broth. I'm resisting the temptation to doctor it up any further with either red or black pepper. That's what I tell my children. That if I can do it, so can they! Wow, a cooking marathon! And, BTW, Jiffy Mix cornbread is great--we like it better than all the scratch recipes I've tried over the years (usually turn out too dense, which we don't like).